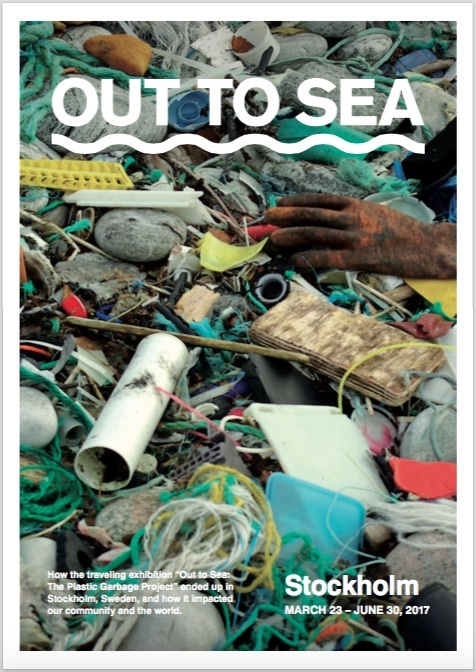 In January 2017, we ran a successful crowdfunding and sponsorship campaign to bring an exhibition on plastic garbage in the oceans to Sweden. The OUT TO SEA Stockholm exhibition opened in March, attracted over 30,000 visitors, and closed on 2 July 2017. Over 8,000 children from local schools also came to experience it. The rest of this website is the archive of the successful 2017 crowdfunding campaign, which attracted donors from 10 countries as well as triggering larger Swedish government and NGO sponsorship. AtKisson Group was one of three major financial sponsors of the exhibit, and we also managed the project, donating hundreds of hours of volunteer time. The rest of the page has been left unrevised as a record of the events at that time. Here you can get all the info about the exhibition, including links to the program (principally in Swedish), Facebook Page (in English and Swedish), and the list of people and organizations who contributed to make it all possible. Scroll down to read the background about the origins of the project, the people behind it, and the crowdfunding campaign. Join us at our upcoming events which you can see either on Facebook or at our Eventbrite site. 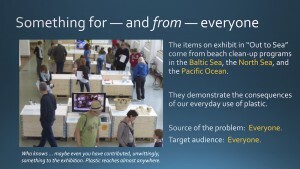 Are you interested in how we financed the exhibition with crowdfunding? Read this article by Alan AtKisson, part of his column series, “North Star,” on the GreenBiz website. THANKS TO YOU, WE SUCCEEDED! 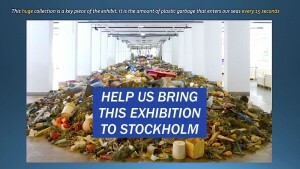 We raised the basic budget we needed to bring this powerful exhibit on ocean plastics to Stockholm. And we did it in just 8 days. CONTRIBUTORS HAVE BEEN WONDERFUL! We raised nearly $35,000, over 300,000 Swedish kronor, from Sunday, Jan 22, through Monday, Jan 30. Of course, your contribution is still very much welcome. We raised the basic budget, but any additional funds will help us expand our educational program and communications work … to increase the impact of this exhibition. Which has become a globally funded event! Your help in expanding our impact — with financial contributions, or other types of support — is extremely welcome. And please follow our progress! You can still become a global sponsor of this exhibit in Stockholm. * Questions? See the “Frequently Asked Questions” below. There are multiple levels to choose from. The buttons below redirect you to our credit card contribution window, powered by PayPal. When your sponsorship donation is complete, you will receive a PDF file to download that confirms your purchase of a sponsorship packet. And you will also receive our very great thanks. Why are you asking for global sponsorship to mount a local exhibition? We tried to raise funds from Swedish business, and we asked over 50 companies to sponsor the exhibition. To our astonishment, not one said yes. Now we have received partial sponsorship from the Swedish government as part of our sponsorship and crowdfunding push, but the bulk of the money that we have raised comes from small businesses and individuals donors. When business surprised us with a unanimous “no”, we were not willing to give up … so, we turned to our friends in Sweden and indeed, around the world. We are deeply grateful that we received such a positive response! What will the money that was raised pay for? Most of it is will go to cover the exhibition fee, 20,000 CHF, to the Museum für Gestaltung. The rest is for transport, insurance, and a little PR. Our museum partner in Stockholm, Tekniska Museet (Museum of Science & Technology), is providing the space and personnel to make this possible. If we raise more, it will help pay for educational programs. Do I get anything in return for my contribution? You are actually purchasing a sponsorship package. When you have completed your credit card transaction, you will receive a link to a PDF file confirming that you have purchased a sponsorship. You are invited to attend the opening of the exhibition in Stockholm on March 22, 2017. And we will send you a PDF e-book later that documents the exhibition and recognizes your contribution. If I am in Sweden, should I pay by SWISH in SEK? Or via PayPal (the buttons above) with a credit card? In Sweden, please use SWISH! Then the money goes straight to our Swedish account. Here is the number again: 123 024 63 06. Later, we will send you a link to confirm your sponsorship and to make sure you get invited to the opening. 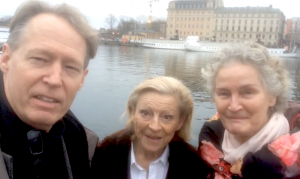 Alan AtKisson (AtKisson Europe AB), Stina Axelsson (PLIMSOLL), and Gunilla Hedén (Art.27 Gunilla Hedén). Stina and Gunilla have long experience with organizing international exhibitions on the theme of water and environment. Alan has long experience with sustainable development. We came together as a team because we care so much for these issues and wanted to bring the exhibition here to Stockholm. We’re all donating time. Alan’s company, AtKisson Group, is managing the administration and also contributing as a financial sponsor. I have other questions! Where should I ask them? Write to us. We have a special email address, outtosea [[at]] atkisson.com, or you can use the Contact form on this website. Write in either English or svenska! We will get back to you as soon as possible.